You have to pass the CLSSBB exam to receive the certification from GAQM. To increase the effectiveness of your study and make you familiar with the actual exam pattern, we have prepared this sample questions. 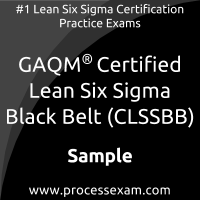 Our Sample GAQM Certified Lean Six Sigma Black Belt Practice Exam will give you more insight about both the type and the difficulty level of the questions on the GAQM CLSSBB exam. However, we are strongly recommending practice with our Premium GAQM Certified Lean Six Sigma Black Belt Practice Exam to achieve the best score in your actual GAQM CLSSBB Exam. The premium practice exam questions are more comprehensive, exam oriented, scenario-based and exact match of GAQM Certified Lean Six Sigma Black Belt exam questions. 01. Cost of Poor Quality (COPQ) can be classified as Visible Costs and Hidden Costs. Which of these items is a Visible Cost? 02. For a process having an average throughput of 7,200 units per hour, what is the average Cycle Time per unit in seconds? 03. Much of the Six Sigma methodology is used to identify and remove causes for _____________ . 04. Control charts and their limits are the? 05. In a Fishbone Diagram the 6M’s stand for Methods, ____________, Machine, Man, Mother Nature and Materials. 06. A kurtosis of -1,2754 indicates? 07. Special Cause Variation falls into which two categories? 08. A two-sample T-test does which of the following? 09. Appropriate measures means that measurements are ______________. 10. An operator is measuring the distance between two points. Which is most likely to be influenced by the operator?